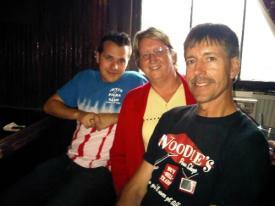 Rocko Dorsey (special guest guitarist for FPB's August 22nd gig), Cindy Halsey (FPB Fan Club Member), and Frank Nelson (FPB guitarist/vocalist) are shown here during FPB's "after gig party" at Sackets Harbor Brew Pub on August 22, 2010. Rocko Dorsey (special guest guitarist for this gig), Frank, Fritz, Mike, and Gabe are shown here at the conclusion of their August 22nd gig in Sackets Harbor, NY. This gig marked the first time FPB ever played on the pulpit of a church! The guys in Fritz's Polka Band along with special guest, Rocko Dorsey tear through a tune on August 22nd in Sackets Harbor, NY. Frank, Fritz, and Gabe are pictured here on August 22nd during FPB's gig in Sackets Harbor, NY. Mike keeps the beat during FPB's gig in Sackets Harbor, NY on August 22, 2010. (Don't his drums look pretty on the pulpit?) Gabe sings out a tune on August 22nd, during FPB's gig in Sackets Harbor, NY. Rocko, Frank, and Fritz are shown here during FPB's gig in Sackets Harbor, NY on August 22nd. 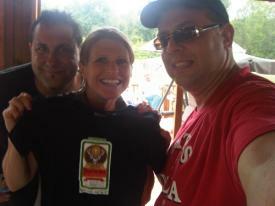 Mike and Fritz present a Jager shirt to Beth on August 21, 2010 in Waterloo, NY at the conclusion of FPB's festive gig at the Dendis Party. As Gabe tears it up on the six string, Frank keeps a close eye on him during FPB's gig in Waterloo, NY on August 21st. Rocko Dorsey (special guest guitarist for this gig) plays a little "slide guitar" during FPB's gig on August 21st at the Dendis Party. Mike is "havin' fun" (isn't there a great song named that?!?!) during FPB's gig at the Dendis Party on August 21st. Rocko Dorsey (who played this gig with FPB as a special guest) and Fritz are shown here on August 21st at FPB's gig in Waterloo, NY for the Dendis Party. Frank shows off his dance moves while playing bass on August 21, 2010 during FPB's gig at the Dendis Party. Rocko Dorsey (who played this gig with FPB as a special guest) and Frank Nelson are shown here on August 21st in Waterloo, NY during FPB's gig at the Dendis Party. 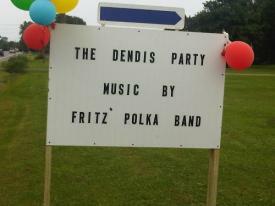 Fritz's Polka Band figured the Dendis Party on August 21st would be festive when this sign welcomed FPB (and the guests). Sure enough, it was a blast!